Earth has endured world wars, global famine and the near-collapse of civilization. It has always survived. But it has never seen anything like this. Facing impossible odds, ex-FedStat agent Lee Mitchell is caught in a race against time to find and eliminate the threat. Earth's all-powerful AIs, the SenANNs, offer hope but have their own agenda for the future of mankind. They also have plans for Mitchell which will make him question what it is to be human. 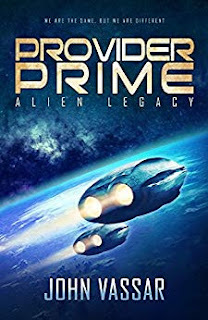 As an alien starship appears on the outskirts of the solar system, the loyalty of the most advanced machine minds the world has ever known will be tested. So will Mitchell’s sanity. With the future of humanity at stake, Mitchell must choose his allies carefully. But after they have invaded his mind for their own ends, even the SenANNs are not beyond suspicion. Ultimately, there is only one question.